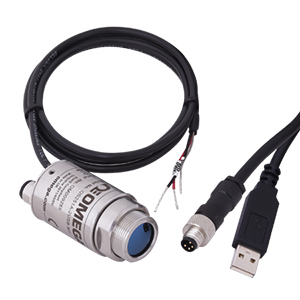 The OSxx1A-2USB series of infrared pyrometers measure temperatures from 45 to 2000°C (113 to 3632ºF) accurately and consistently, with an outstanding response time of 200 ms. The sensors will operate with the 4 to 20 mA, 2-wire output connected (loop powered), the USB cable connected, or both. No external power supply is required when using just the USB output. The free OmegaConfig software is a simple application for configuration, real-time display, charting and CSV text file logging of measured values via the USB cable supplied. User configuration settings include 4-20mA output scale, emissivity, averaging, peak/valley and reflected energy compensation. MODBUS over USB communication also allows configuration and reading of measured data by other compatible applications or user written software. The USB cable has an IP65 connector at the sensor end. An IP65 cap protects the sensor when the USB cable is not connected. Maximum Span: Full temperature range. Dimensions: 27.6 D x 61 mm L including cable glands. Add suffix -2.2CE(*) for Cable extended, for uncooled IR USB series, 30 m max total cable length. 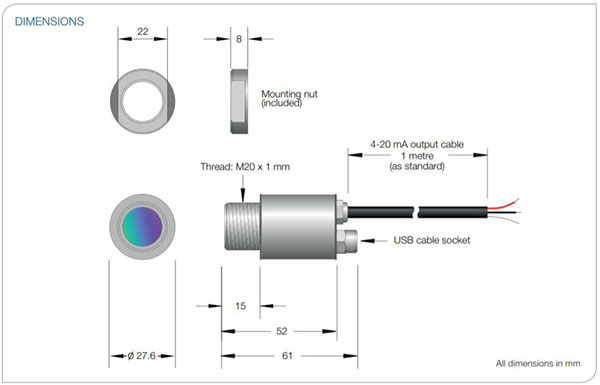 * 1 m cable is included as standard on every sensor. Extended cable is added to that length, add suffix to model number. Insert cable length in metres. Comes complete with sensor head, 1 m cable, USB cable and operator’s manual. Software available for Free download.